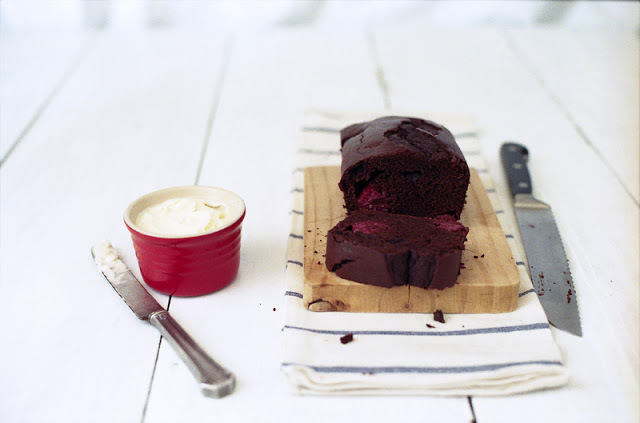 Cocoa Coffee Bread with Raspberries — always with butter. A sweet rich bread that could practically be considered a cake, but lets just call it bread, so we can eat it for breakfast. *color balance is a bit off in these photos, I know, I was having trouble going from scanner to photoshop. So finally a recipe post! I feel like I have not posted a proper recipe in a long time. But I have gotten back into the swing of things and am baking like crazy again. Going to the farmers market in San Francisco has made me want to bake up a storm. Everything looks so amazing and fresh there that I get so many ideas of what to bake. On Sunday I baked three different things, and photographed them of course. All from goodies from the farmers market, so more frequent recipe posts to come! This bread comes out super soft and luscious, and the whole raspberries in it make a nice little surprise. Swap out the raspberries for any other berry you fancy, blueberries would be a great idea and make it a nice dark colored loaf. Another delivery in the city today for the bakery. This one was pretty close to the crowds of downtown but I at least found a spot to stop for a minute to let my co-worker run out of the car to deliver the cupcakes. And then getting back to the shop was a bit of an adventure. Knowing that we need to head to the right of where we were and not understanding why the GPS said to left, we decided to go our own way. Which did not work out the best. After a few confusing turns, we ended up on the Bay Bridge which was the exact opposite of where the shop is. We needed to go further into San Francisco not leave it entirely. Luckily we were able to turn around at Treasure Island so we didn't have to pay the bridge toll, which is outrageous. The photo above is my favorite, love how crackly the tops of the loaf came out. I'm going to see the Claire Ptak baking demo/lecture presentation thing tomorrow night! I can't wait!! Oven 350. Butter & flour two 3’’ x 7’’ loaf pans. batches, gradually mix in flour mixture & buttermilk mixture. Once throughly combined, fold in raspberries. amount of butter then serve.